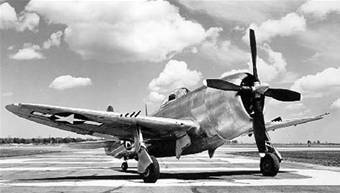 On Wednesday, June 23, 1943, two P-47B fighter planes assigned to the 326th Fighter Group, 322nd Squadron, based at Westover Field in Massachusetts, were engaged in a training flight over Lyme, Connecticut, when they collided in mid-air in the vicinity of the Lyme School. The pilot of one plane, (41-6035) Lt. Elmer Buss, was able to bail out safely, but the pilot of the other plane, (41-6052) Lt. William Carlton Ives, 21, was killed. Lt. Ives is buried in Highland Park Cemetery in Elizabeth City, North Carolina. For a photo of his grave, see www.findagrave.com #86564235.